Given the exuberance around Tesla electric cars, it might have been tempting for a new clean-tech company specializing in rechargeable lithium-ion batteries to try to crack the electric vehicle market. But from the outset, Corvus Energy focused primarily on marine applications – ferries and ships. The Richmond-based company’s recent growth figures vindicate that focus. 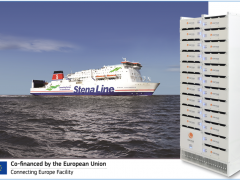 In just seven years, it has come to dominate the market for lithium-ion batteries for the marine sector, particularly in northern Europe, where more and more ferries and ships are running either partially or entirely on battery power. “We’ve got the largest install base, by far, in marine – something approaching 70% of the installed base in the marine and offshore world is Corvus,” said Corvus CEO Andrew Morden. Corvus tops this year’s Business in Vancouver list of fastest-growing companies. Over a five-year period, the company’s revenue has grown from $123,917 in 2011 to $6 million in 2015. Its revenues doubled from $6 million in fiscal 2015 to $11.5 million in fiscal 2016. Founded in 2009, the company focused on developing batteries that could withstand the wet, corrosive environment of the ocean. Some of the original founders have since left to start a rival company, and the two companies are now involved in a legal dispute. In 2011, Corvus received $582,467 from Sustainable Development Technology Canada (SDTC) for a hybrid electric ferry demonstration project in Norway. The SDTC funding helped leverage another $1.1 million in private funding and attract two large corporate investors. Since then, it has come to dominate the marine market. “We consider the project to be one of our success stories because it’s an elegant yet robust and versatile solution, especially for the incredible demands of the marine environment,” said SDTC public affairs manager Gillian Cartwright. One of the keys to Corvus’ success was being first to market. Corvus’ largest shareholder is the Oslo shipping giant BW Group. The second-largest investor is the venture arm of Statoil ASA (NYSE:STO), Norway’s national oil company. Although the marine market is the mainstay of Corvus’ business, it has also supplied lithium-ion batteries for a number of other transportation sectors, including trains, trucks and submarines. Morden describes his company’s approach to markets as “hourglass shaped.” It started out providing batteries for a variety of markets, narrowed in on the marine sector, mostly in Northern Europe, and is now branching out again to other “verticals” and geographic markets – notably China. That new generation of batteries is the Orca ESS platform, with two main product lines. One produces more power and can recharge faster, while the other can store more energy. One Chinese port is now using Corvus batteries instead of diesel generators to power gantry cranes, and Morden said there is a big potential market for energy storage in offshore wind farms. A number of pilot projects have also used Corvus batteries to power trains and light-rail systems. Northern Europe – particularly Norway – has been Corvus’ most important market. Northern European countries not only have a lot of ferry traffic, due to their geography, but they also have a lot of hydro power, so it makes a lot of sense to power ferries with rechargeable batteries. Norway is such an important market that Corvus has opened an office there. Although there has been less uptake in Canada, one company that has become a Corvus customer is Seaspan Ferries Corp., which is using Corvus batteries in two new ferries under construction that will run on liquefied natural gas and battery power. As for the company’s head count, it has actually fallen – from a peak of 70 down to 45 – as it has moved from demonstration to commercialization.